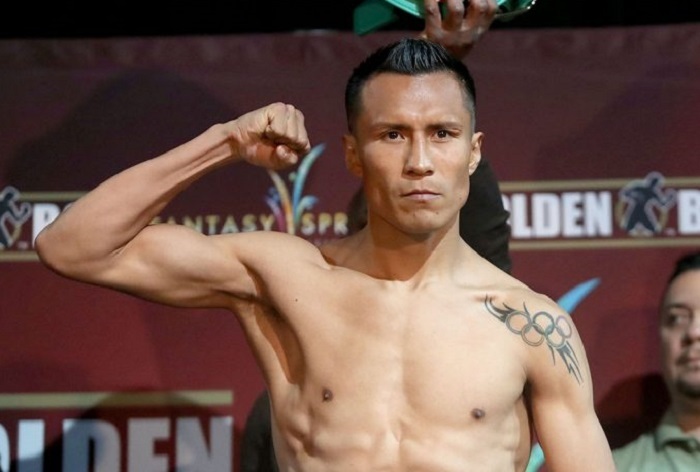 Francisco Vargas made a statement of his own at the expense of Rod Salka Thursday night, stopping the fringe contender after six rounds at the Fantasy Springs Resort Casino in Indio, California. Vargas (25-1-2, 18 knockouts), the former WBC junior lightweight titleholder, battered and broke down Salka from the opening bell. The 33-year-old Vargas, who resides in Mexico City, might have been motivated from the trunks Salka wore, which depicted a red, white, and blue wall, with “America 1st” on his belt-line. Vargas continued to walk Salka down, closing the distance and ripping combinations to the head and body. Salka attempted to load up and fight back, but he was constantly on the defensive. His punches had little effect on Vargas, who sensed Salka was tiring with each passing round. Near the end of the fifth round, Vargas dropped Salka, landed two punches to the body followed by a right hand to the head. Salka survived the round and the sixth, but was clearly in no shape to continue, as there was bruising all around his left eye. After consulting with the ringside physician, referee Jerry Cantu stopped the bout after the end of the sixth round. Punch stat numbers overwhelmingly favored Vargas, who connected on 112 of 415 total punches 27 percent). Salka connected on 75 of 112 total punches (18 percent). Vargas hopes to face the current WBC junior lightweight titleholder Miguel Berchelt in a rematch. Salka, who failed to win a seat in the Pennsylvania House of Representatives as a Republican candidate in 2016, falls to 24-5, 4 KOs. In the co-feature of the “Golden Boy Boxing on ESPN” telecast, Andrew Cancio returned from a 17-month layoff to stop previously-unbeaten Aidar Sharybayev in the 10th round. Cancio (18-4-2, 14 KOs), who resides in nearby Blythe, dropped the Kazakh fighter with a counter left hook to the head near the end of the third round. The lack of head movement by the Miami-based Sharibayev (7-1, 6 KOs) made him easy to hit. Cancio dropped Sharibayev again in round five, this time with a lead right to the head. Sharibayev fell awkwardly to the canvas, which led to him having difficulties defending himself or sitting down on his punches. Cancio battered Sharibayev throughout the second half of the fight. Referee Raul Caiz Sr. looked on the verge of stopping the fight on several occasions until Sharibayev’s corner threw in the towel at 40 seconds of the 10th round.